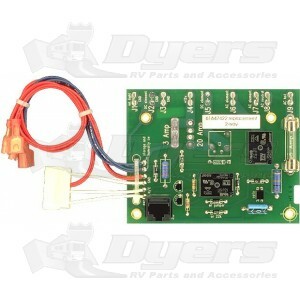 AC/Gas Replacement Board for NORCOLD: 652, 662, 682, 6052, 6062, 6082, 6162, 6182, 6621M, 6821M. Circuit breaker on the board to protect 12V circuits from short circuit damage and a short circuit indicator that indicates shorts in wires to the main switch or interior light. Heavy-duty diode trips circuit breaker if the 12V DC is hooked up backwards. Fuses on the 120V AC circuits give you protection from short circuits in the heater wires and element. NORCOLD: 652, 662, 682, 6052, 6062, 6082, 6162, 6182, 6621M, 6821M. Match Norcold's® part number to our part number. The 61647422 board can also be replaced by the 618661 board. I am very pleased that my problem became your solution. Shipped fast had fridge working in 5 minutes, can't ask for more than that. Dyers is a great company to order from. Price was the best and part arrived the next day.